Osteoporosis, which means “porous bones,” is a bone-thinning disease that can lead to debilitating fractures, typically in the spine, hip and wrist. Although the condition is often considered a “women’s disease,” men also are affected. 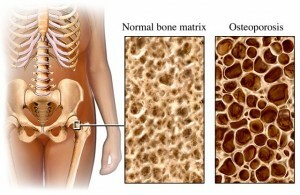 In the United States, an estimated 10 million people already have the condition and almost 34 million more have low bone mass, placing them at increased risk for osteoporosis. Of the 10 million Americans estimated to have osteoporosis, 8 million are women and 2 million are men. Your doctor can help determine if you should have a bone density scan. They are recommended if you are age 65 or older regardless of risk. A bone density scan is a simple, non-invasive and painless exam to measure bone mass in areas such as your spine, hip, wrist, finger, kneecap, shin bone and heel. The standard test uses a low dose X-ray to detect signs of bone thinning and mineral loss. The scan measures the density of the spine and hip. The forearm is measured in people with hyperthyroidism or if either hip cannot be scanned. Some doctors will order just a hip scan as a screening study for patients under the age of 60. 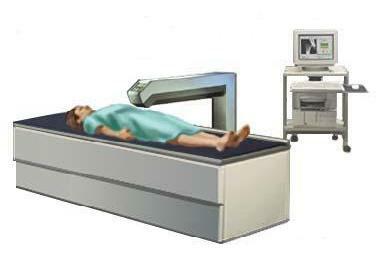 There are several machines that measure bone density. Central machines measure density in the hip, spine and total body. Peripheral machines measure density in the finger, wrist, kneecap, shin bone and heel. At Diabetes & Endocrinology Specialists, Inc., we offer screening, using a central machine, for the hip, spine, and wrist. Our bone density scan takes about 15 minutes, including registration. During the procedure, you will lie on a table scanner for five to eight minutes. A technologist will sit next to you throughout the procedure. NOTE: Medicare only allows one procedure every 2 years. It is the patient’s responsibility to ensure that they have not received a bone density from another location within those two years or the cost of the procedure may be the patient’s responsibility. Do not take any vitamin pills or mineral supplements the morning of your exam. You must not have any exams involving barium or radioisotopes within the last month. These scans interfere with the bone density results. If you are pregnant, DO NOT receive bone density testing. Please wear pants or shorts without any metal pieces (e.g. metal rivets, zippers, buttons, or belts) as it will interfere with the accuracy of the test. A gown or drape will be provided if metal appears on pants or shorts. The results of your bone density scan will be available within three to five days. This information will enable your doctor to determine if you’re at risk for fractures and require further evaluation. The lower your bone density, the higher your risk for fracture. Test results also help you and your doctor plan the best course of action for your bone health. NOTE: We no longer do bone density scans in our office. We recommend having your scan at CDI Women’s Health Center, located at: 450 North New Ballas Road #250N, St. Louis, MO 63141. To schedule an appointment, please call: 314-567-4449.